The fifth highest mountain in the World. Mount Makalu (8,463 m), the fifth highest mountain, is located between Mt. Everest (8,848 m) and Mt. Kanchanjunga (8,586 m). Situated in the North East, Mt. Makalu lies in the very precious and diverse landscape of Makalu Barun National Park. 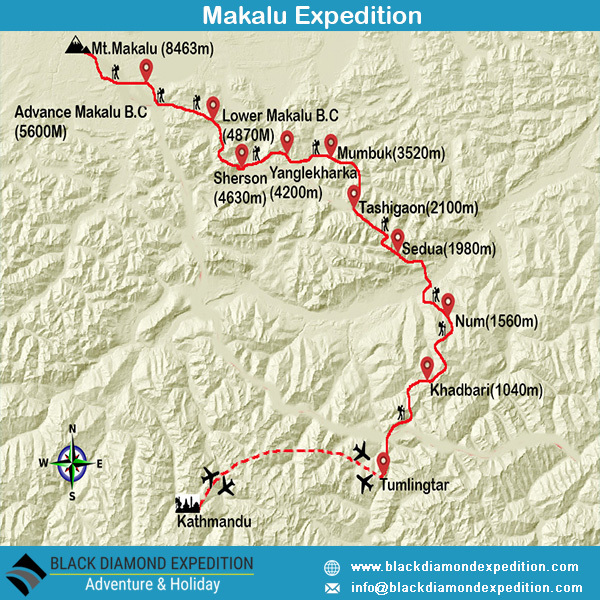 Makalu means the great black one, so called due to its very dark appearance. The perfect Pyramid shaped with four sharp ridges makes this mountain very beautiful and spectacular one. Due to the isolation and relatively inaccessibility, the area has pristine cultural and biological treasures which add unforgettable memories to the visitors. Mt. Makalu Expedition is relatively challenging, potentially dangerous but equally rewarded and self-esteem. Mt. Makalu was first climbed by the French group in 1955. Because of its difficulty it is less attempted Mountain. Before planning for climbing the Mt. Makalu, previous experience of climbing mountains including at least one 8000m above is recommended. Arrival in Kathmandu. Transfer to your hotel. Upon arrival at Tribhuvan International Airport in Kathmandu, one of the representatives from Black Diamond Expedition holding a placard having your name displayed will receive you and transfer you to the hotel. Unless you have a jet lag, the guide will introduce you the crew members and explain the trip activities briefly. If time permits, you can hang around the streets of Kathmandu or have a rest at the hotel with a welcome dinner. Overnight in a hotel. After breakfast, you will be taken to the memorable UNESCO Heritage Tour. You will visit the Pashupatinath Temple, Bouddhanath Stupa and Swoyambhunath Stupa (Monkey temple). You will then be taken back to your hotel where we will check the equipment for the trip and go shopping for the missing items and be prepared for the trip. After breakfast, you will be taken to Kathmandu Durbar square for sightseeing and then the whole of the afternoon will be spent again for preparation and final check up. This expedition is really challenging and of advance type, therefore, we need to get well prepared by checking even the smallest bit of the necessary equipment and accessories to make our trip successful. Today we will fly to Tumlingtar from Kathmandu. This flight takes about 50 minutes. You will enjoy the scenic aerial views of mountains such as Ganesh Himal, Everst, Makalu and Kanchenjunga. Upon arrival at Tumlingtar Airport, we will descend towards Shawa Khola (a small river) from where you will view Chamolang Mountain at a distance. Walking along the river, we will proceed towards Khadbari, a mountainous town with some facilities like banking. Overnight in Khadbari. Today, we will proceed towards Mane Bhanjyang climbing uphill. We will pass through terraced fields and local villages of Pangma and reach Bhotebas. This pretty village offers spectacular mountain views towards the north. Walking past tiny local settlements and the rhododendron forest, we will reach Sakurate, where we will spend the night in a teahouse. Another exciting trek begins today. We will trek downhill from Num and walk through a forest enjoying the birds chirping and finally we reach Lumbang. Further, we descend down to Arun River. Walking along the slippery path, we go across a suspension bridge and start climbing uphill and trek until we reach Sedua. For your kind information, Sedua is an entry point to Makalu Barun National park. Overnight in Sedua. Today, we will continue our journey through the farmlands and mani walls. We will climb again the uphill above Ipsuwa and Kasuwa Rivers passing through Sherpa village of Navagaon and finally we will arrive in Kharsing Kharka. Today’s trek ends when we reach Tashi gaon. Overnight in Tashigaon. Our trek begins early in the morning today. Leaving Tashigaon, we will walk through rhododendron and oak forest. The trail takes us through different pastures and lush green vegetation where we can see local animals grazing. The zigzag trail passes through stone steps and finally we reach Khongma, located atop the hill. Overnight in Khongma. Leaving Khongma, we will pass through colourful forest and reach to the ridge with mani walls and prayer flags. You will be thrilled with the panoramic views of Kanchenjunga. We will trek past the Keke La pass (4,230m) and Tutu La pass (4,200m) before descending down through rhododendron forest to Mumbuk. Overnight at Mumbuk. Today’s trek remains a bit challenging as we have to walk through the landslide prone area for about 3 hours after we leave Mumbuk. You will oversee Barun river from most of the points of this trek. Nevertheless, the panoramic views of mountains such as peak 6 (6,739m) and peak 7 (6,185m) will enthral you and you will not realize that you are trekking through the difficult trails. We continue walking until we reach Yanglekharka. Overnight in Yanglekharka. Today, there is no trek. We need to acclimatize and prepare for the upcoming treks. YangleKharka is one of the best places to take rest. The view of mountains from YangleKharka is unbeatable. Explore around YangleKharka for proper acclimatization and prepare yourself for the challenging climb to Makalu summit. Overnight at YangleKharka. Another exciting trek begins today. We walk upstream until we reach Nglekharka. You will be captivated by the views from NgleKharka. Further trek, leads you to the alpine meadow of RupakKharka and JhakKharka. Walking past waterfall, we will reach summer grazing land of Yak Kharka from where we will head west and walk through gravel area with breath-taking view of Lower Barun glacier and finally arrive in Sherson. Overnight at Sherson. Walking along the eastern side of the valley today, we will enjoy the panoramic view of Mount Makalu. We will further descend to a small pass and further down to Makalu Base Camp walking through boulders. You will really feel blessed by the breathtaking view of the south face of Makalu Base Camp. Overnight at Makalu Base Camp. The hardest part of our journey is about to begin and therefore, you will have to rest and acclimatize today. There are many view points to the right of our camp from where you will have a closer look of Mt. Makalu, Barun Pokhari, Lhotse and Everest. Those who still want to hike, can take a short hike to the green vegetation around and return to the Base Camp. Overnight in Makalu Base Camp. Walking through the desolate area from lower Makalu Base Camp, we will reach to Advance Makalu Base Camp that exists at the snout of Barun glacier. We will place our camp nearby the glacial pond. We can climb a little higher than our camp for better view of Makalu. Return to Advanced Camp to spend the night. Day 18 through day 50 are dedicated in climbing Mt. Makalu. We will choose the normal route that progresses through southeast ridge. We will place 3 High Camps. Return trip begins today. We will clean Makalu Base Camp and return to YangleKharka via Sherson. The path is scenic with panoramic views of several mountains. Overnight at YangleKharka. Return trail from YangleKharka to Mumbuk is easier as we will be following descending trail for most of the day. We will walk past rock fall and then the trail takes us through rock gully all the way to Mumbuk. Returning to Mumbuk, we will be greeted with green sceneries. Overnight at Mumbuk. Leaving Mumbuk early in the morning, we will walk through rhododendron and fir forest. We need to cross Keke La, Shipton La Pass and Ghurung La Pass so that we can reach Khongma. The trail takes sharp descend from Khongma to TashiGaon where we will stay overnight. After early morning tea, we will return to Chichila and continue our journey through Mane Bhanjyang to Tumlingtar. Overnight at Tumlingtar. We will take flight back to Kathmandu from Tumlingtar. Once we reach domestic airport in Kathmandu, you will be transferred to hotel. Take rest. Stay overnight at your hotel. You will be transferred to the Airport as per your flight schedule. Porter & Yak from Tumlingtar to Base Camp & back to Tumlingtar. Liaison officer's allowances equipment for Expedition, flight ticket, insurance, daily wages sharing with another group of Nepalese staff. Makalu Expedition Permit, National park permit and TIMS. Emergency Oxygen- Mask and regulator.